On February 13, 2016 February 16, 2018 By felicitousfelixIn Are There Lesbians? Stuck with the banished King Richard (Timothy Omundson) after the final episode of Season One, Galavant (Joshua Sasse) must travel to Hortensia to rescue Princess Isabella (Karen David) who is being forced into marriage to her cousin (although she does pretty well for herself without Gal, being the strong, independent, female Beyonce would want her to be). Meanwhile, held hostage back in Valencia Gal’s reasonably faithful squire Sid (Luke Youngblood) is forced to placate two very strong-willed people after Queen Madalena (Mallory Jansen) crowns Richard’s childhood friend, Gareth (Vinnie Jones), King – with unexpected results. Add some giants-who-aren’t-giants, dwarves-who-aren’t-dwarves, magical mix-ups, a very evil wedding planner and a dragon-who-is-definitely-a-dragon and we have an exciting second season, with all the intertextual humour and musical comedy that I know and love from the first season. Ok so there clearly aren’t any lesbians in Galavant – although I wouldn’t be surprised if there were by next season. Honourable mention however must go to Princess Jubilee who is, to all intents and purposes, bi, and also to the Enchanted Forest, a gay bar that Richard and Gal find themselves trapped in like some sort of fabulous Circe’s island. Of course the latter is played mostly for laughs although the comedy is mostly based around Richard’s inability to realise that he is in a gay bar, rather than the fact that gays are funny. Stereotypes abound, including a very jazzy Kylie Minogue number, featuring the girl from Neighbours herself. For queer representation however, that is about the extent of it. Mostly, Galavant focuses on developing strong, female characters. The first season saw both Madalena and Isabella evolve from the stereotypical love-interests we expected them to be, to complex characters in their own right. While the majority of the cast is male, the female characters stand out for more reasons than the simple fact that they are female – each possessing their own opinions and motivations, outside of the men in their lives (except Isabella in a few episodes, but there are reasons for that). Several romances do develop, and while I do have some issues with everyone suddenly pairing off, for the most part they feel incredibly natural and overall don’t make the viewer feel like the women involved are there simply to be a prize for male good behaviour. In a series that is essentially about knights and various masculine tropes, it is good to see pretty much all of that turned on its head. Whereas before I mentioned that the women are able to evolve emotionally a separate from their male counterparts, the series also doesn’t shy away from male sensitivity over more classic male emotions… or lack thereof. For instance, Gal suffers greatly from the lack of care that his father had, and consequently isn’t very good with emotions, or sarcasm as we later find out. 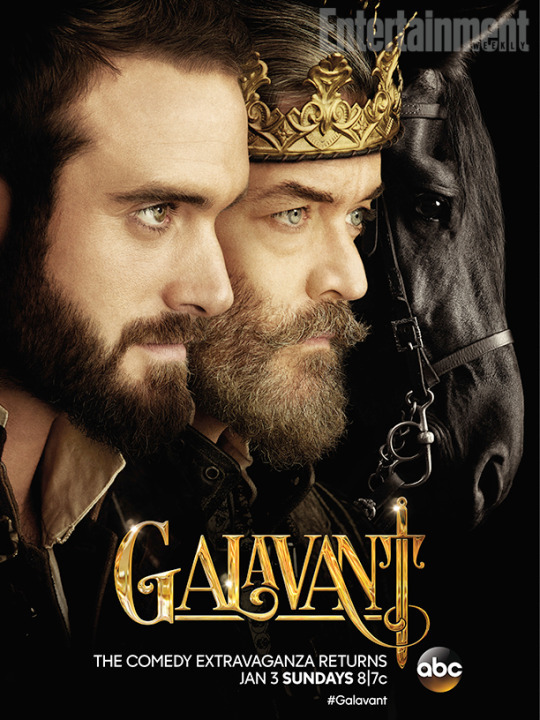 Galavant is a series that is unashamedly funny and uses all the fantasy tropes we have come to know and love from series like Game of Thrones and Monty Python and the Holy Grail. With a dearth of light-hearted and non-gritty television, Galavant is there to clear the air with song and dance numbers and a delightful sense of self-awareness. Put simply, it is a series I cannot recommend highly enough, and Season Two was just as good as, if not better than the first, and there had better be a Season Three! badass ladiesgalavanti super believe in you tad cooperreviewseason 2tv showwhere be lesbians?